A long apprenticeship at age 15 on the burgeoning local folk music scene. Four world-class singles of original material over a 12-month period in 1969. And retired in 1970 at age 17, just as the singer songwriter explosion was set to flourish. Lynne Pike taught herself to play guitar at the age of 12 and in 1965 at age 13 she appeared in public for the first time at Auckland's Shiralee nightclub, backed by Ray Columbus and The Invaders. After seeing Judy Collins and Josh White in concert, her pop sensibilities changed forever and her attention turned from pop to folk music. Shortly afterwards she became a regular performer at Auckland's Poles Apart Folk Club. The manager and owner of the Poles Apart was the entrepreneurial Simon “Curly” Del Monte, who became her manager. For the next two years Lynne built up a formidable reputation on the burgeoning local folk scene. For the next two years Lynne built up a formidable reputation on the burgeoning local folk scene where she was often backed by guitarist John Bergerson. As Lynne's popularity increased so did the need to extend her repertoire, which lead her to writing her own songs. In early 1969, manager Curly Del Monte started his own record label, Phreadd, to specifically record Lynne, who was now 17 and had built up an impressive portfolio of original material. Her first single, ‘Trying To Win’ b/w ‘Sweet Loving Baby’, was released with little fanfare in April and quickly went missing in action. Unperturbed, Curly soon had Lynne back in the studio, this time complete with a string section. The resulting single, ‘The Colour Of Crimson’ b/w ‘Steal It’, was greeted with rave reviews and Lynne performed the song on C'mon 69. 'The Colour Of Crimson' was tipped to become a finalist in the Loxene Gold Disc finals for 1969 and by all accounts it just missed out on the final cut of 10 entries, ironic when you consider that the only locally written finalist that year was Dave Jordan’s ‘Out Of Sight Out Of Mind’ as recorded by The Avengers. 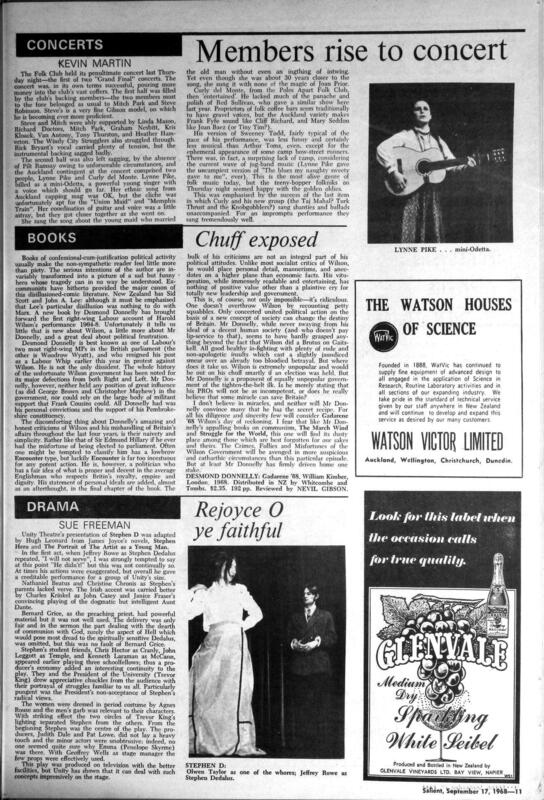 Lynne was awarded a Playdate magazine Pop Award in 1969 as one of the stars ro watch. The next single, ‘Given Time’ b/w ‘See You Later Baby Blues’, was released in November 1969. Having just finished a session and about to leave Stebbing recording studio, Bruno Lawrence heard Lynne running through the songs and was so impressed by what he heard that he demanded to play on the session, which he did. Lynne appeared on the first episode of the new locally produced entertainment TV show Happen Inn (the replacement for C’mon) to promote her fourth and last single ‘I Think I Just Lost Out’ b/w ‘I Shall Be Released’ in March 1970. By the end of 1970, Lynne had moved to Christchurch and retired from public performances to concentrate on her songwriting, which paid dividends when she won an International peace award for one of her compositions in the late 70s. In 1984 Lynn Pike returned under her married name Lynn Clark with an album The Gulls Of Naxos, and the title track on a 1986 anti-nuclear cassette release Send the Boats Away. Both were released on the Trevor Ruffell and Keith Gosney owned Hastings label, Cityfolk. After spending most of his life championing the folk music scene in New Zealand, Curly Del Monte turned to character acting in the 80s and appeared in several movies and productions. Three of Lynne's tracks appear on the now deleted 2005 EMI CD The Kiwi Folk Scene, compiled by Grant Gillanders.